Scienta has pioneered the use of processor controlled measuring heads that are capable of real-time linearization of the measurement signal. 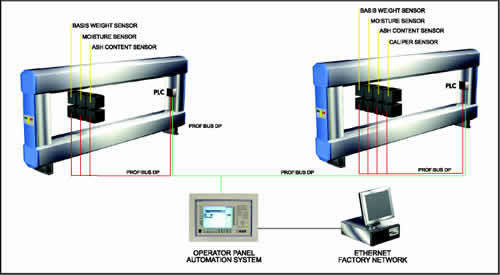 Thanks to a Fieldbus connection, the output signal can be easily and accurately interfaced to a variety of computer and programmer equipment. The Fieldbus connection also enables monitoring of diagnostic data available inside the measuring head and the ability to control the head in manners not possible with analog systems. The sensor electronics are also built into the receiver body making it a highly compact unit. Lastly, temperature compensation and chamber gas pressure monitoring are all part of the extensive functionality of the Scienta developed sensors. Scienta offers basic machine control strategies including: Decoupled Weight Control, Dry Stock Flow Control and Decoupled Moisture Control. Also consistency control and CD control may be implemented using Scienta's actuators and sensors as needed. The basic control strategy is a Machine Direction (MD) type of control but Scienta has also implemented many profile control applications. The best control strategy implementation comes from individual evaluations of each machine and process type. The Scienta QCS System utilizes the latest data processing, measurement and communication technology with advanced scanners to offer easy-to-use process control tools. 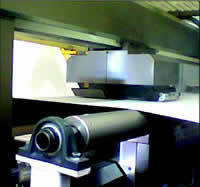 This allows for maximum process performance on paper or printing machines. The QCS System is tailored to customers' specific requirements utilizing a modular hardware design that ensures affordability and guarantees future flexibility. The System is built to withstand components such as heat, dust and resin, and designed using 50 years of measurement experience. Data from the QCS scanning sensors is prepared with high performance 32-bit RISC processors which allows for real-time floating-point calculations in the sensor board. Also the whole electronic part of the sensor is fitted on a single PCB board, which is embedded into the sensor's mechanical structure. This minimizes component count as well as the number of spare parts.